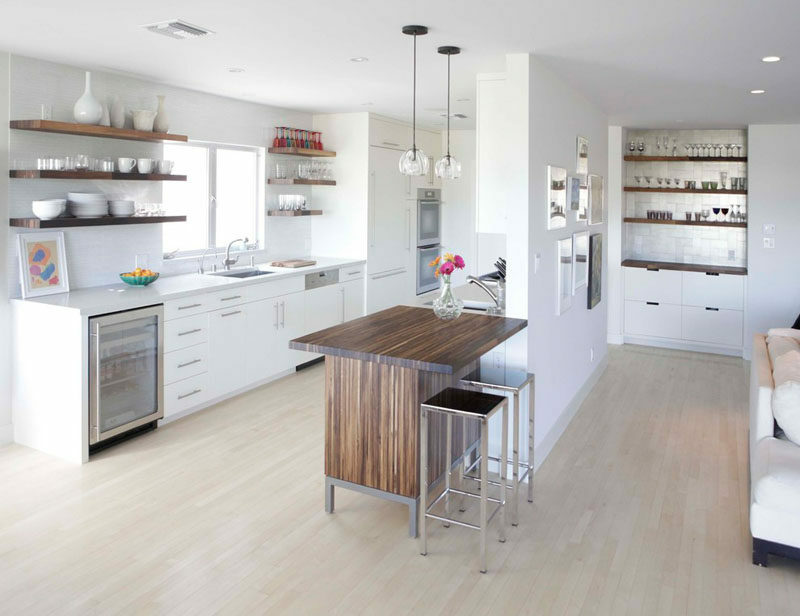 Open shelving is a style of shelving with a surprising amount of controversy surrounding it. Sure, it displays all of your beautiful plates, mugs, cups, and bowls, but it also means displaying all of your not so beautiful plates, mugs, cups, and bowls. While some people love it and others love to hate it, open shelving is a trend that’s being seen more and more these days. 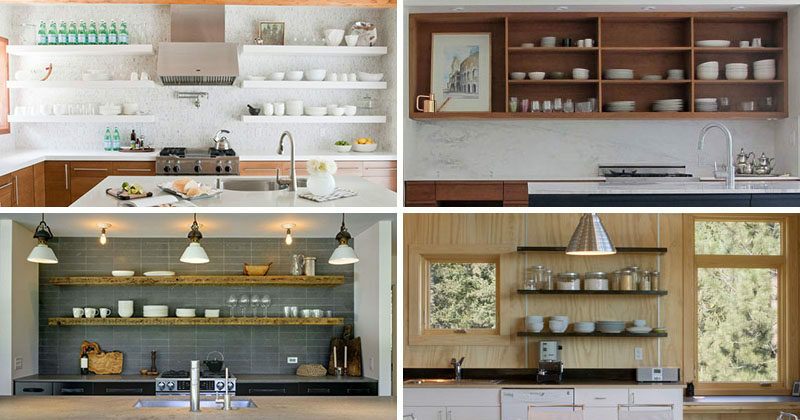 Love it or hate it, here are 19 examples of kitchens that have done open shelving in a variety of different ways. 1. 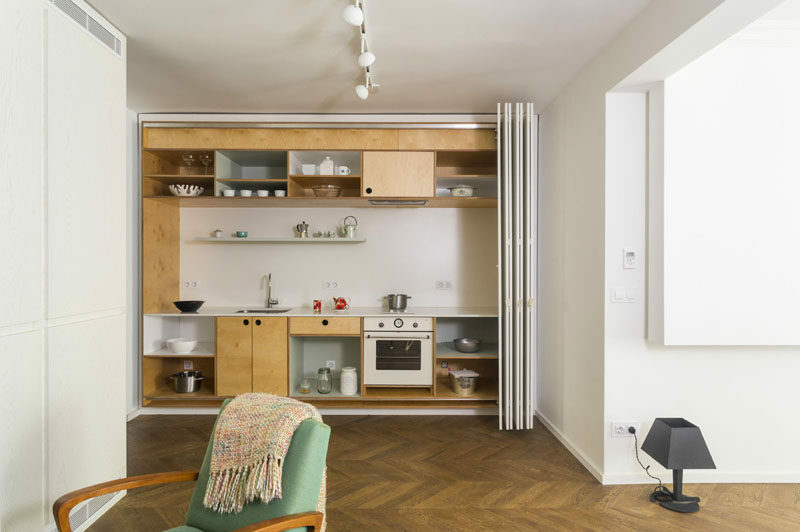 This tiny kitchen features both open and closed shelving on the top and bottom parts of the kitchen, creating the ability to display the beautiful and hide the not-so-beautiful. Designed by dontDIY. Photography by Asen Emilov. 2. 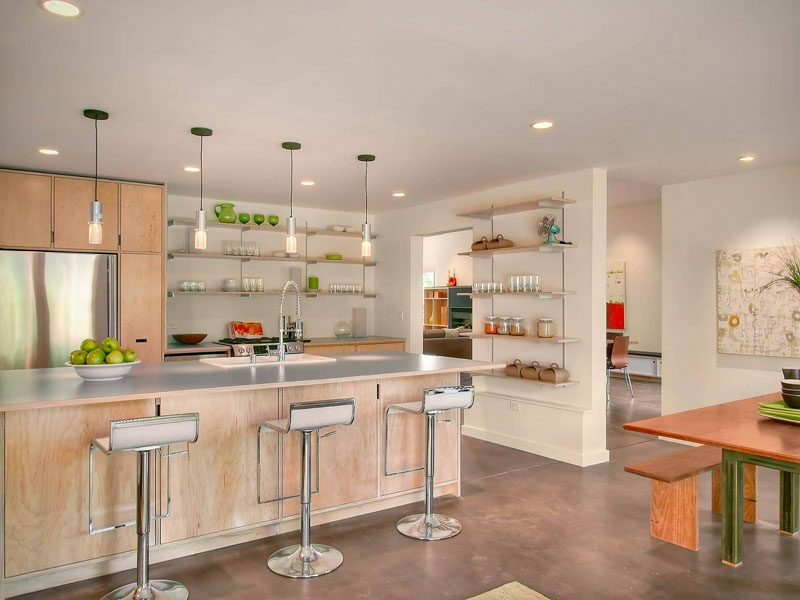 The open shelving along the back wall of this bar/kitchen displays the fancy alcohol bottles without looking cluttered. 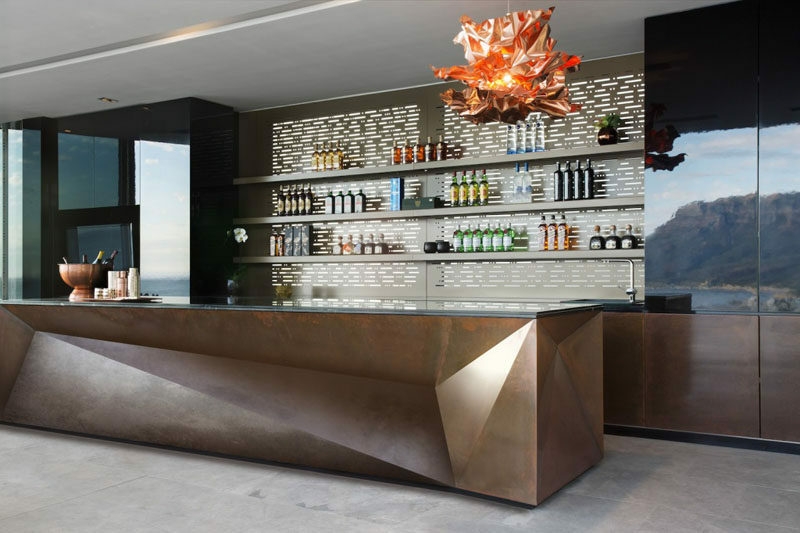 Designed by SAOTA and Janine Lazard Interiors. Photography by Adam Letch. 3. 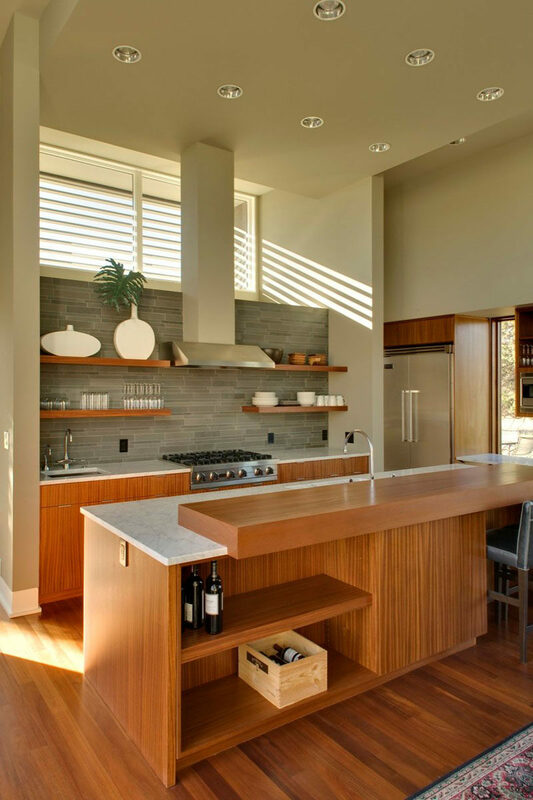 Open shelving along the top part of this kitchen keeps the simple plates and bowls on display and makes them easily accessible. 4. 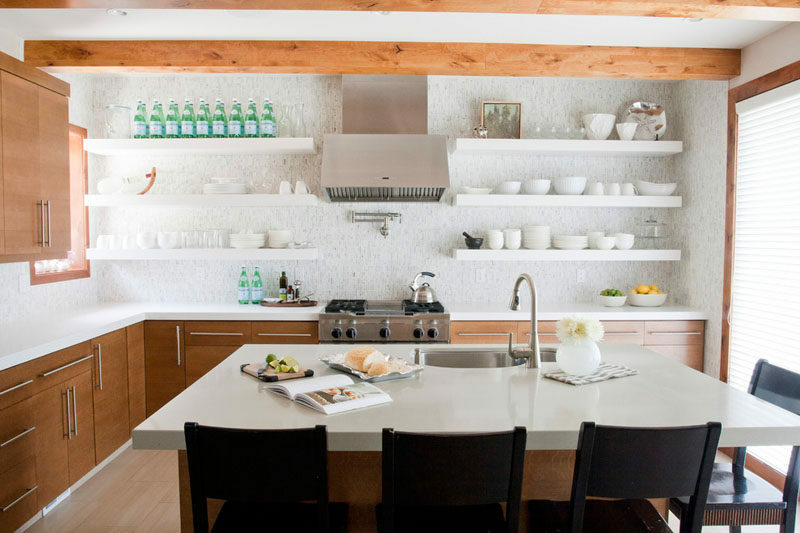 Floating shelves above part of the counter in this kitchen keep the everyday plates and mugs at arms reach so they’re easy to grab and go. Designed by Robert Nebolon Architects. Photography by Matthew Millman. 5. 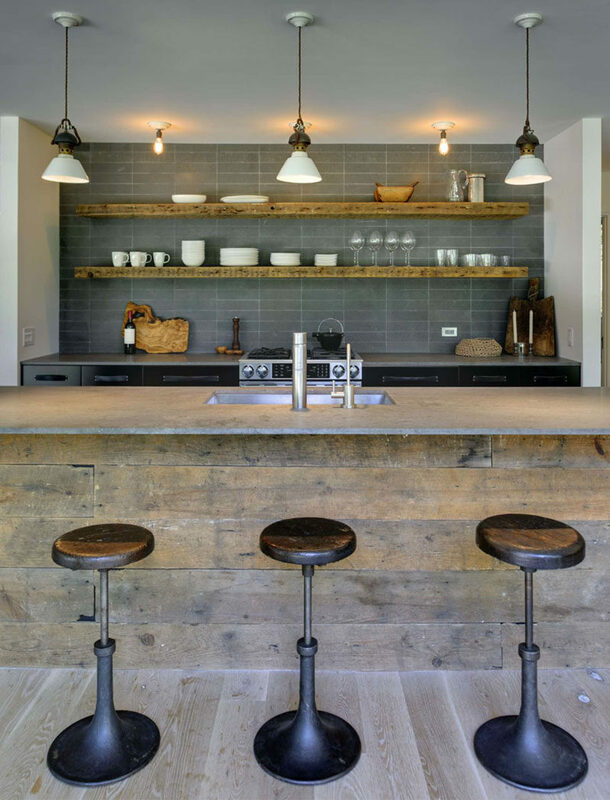 Long wood floating shelves mixed with a concrete countertop creates a rustic yet contemporary feel. See more photos of this home, here. Designed by Bates Masi Architects. Interior Design by Athena Calderone. 6. 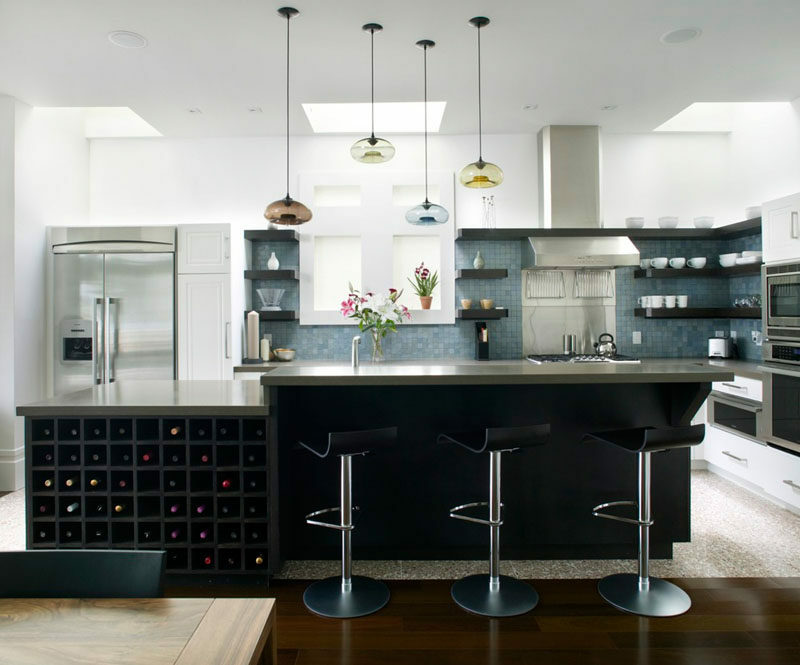 Open shelves on either side of the stove keep essentials at hand, while open shelving in the island keeps the wine on display but out of the way. Designed by TVA Architects. Photography by Stephen Cridland. 7. 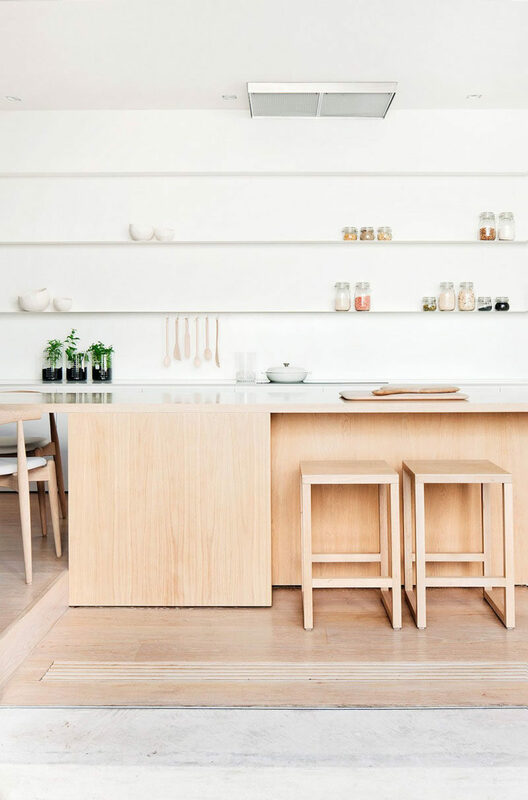 Long white open shelves almost appear to blend into the background and create plenty of space for storing bowls, utensils, and food. Designed by studiofour. Interior Design by Annabelle Berryman + Sarah Henry. Photography by Shannon McGrath. 8. 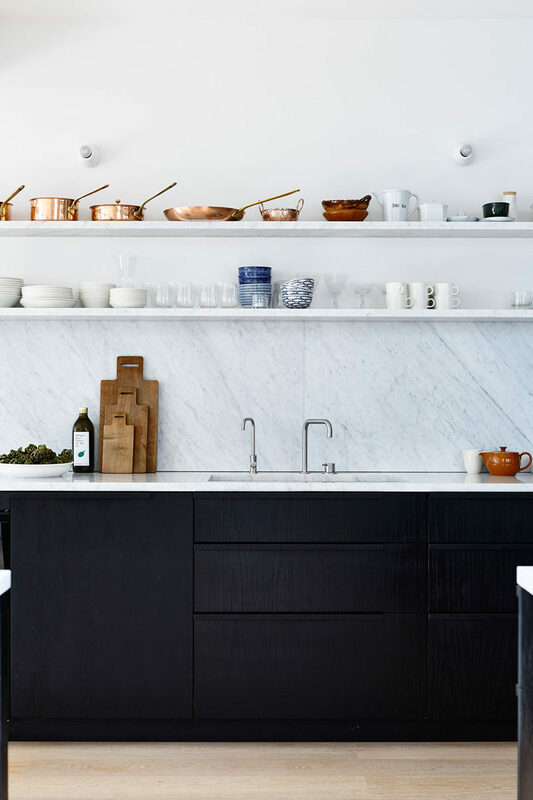 The open shelving in this kitchen puts things like beautiful cake stands, cutting boards, cookbooks, as well as daily essentials, like butter and coffee mugs, on display for all to see. Interior Design by Studio McGee. Photography by Travis J Photography. 9. 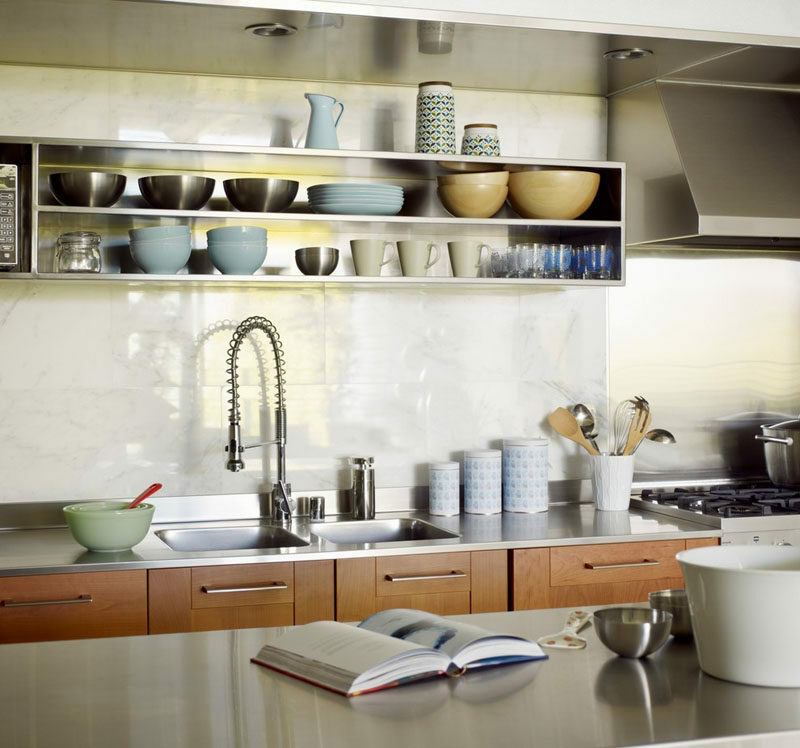 These long shelves in the same material as the backsplash, are positioned above the sink and counter to provide a convenient spot for storing pots, pans, plates, and mugs. Designed by O’COnnor and Houle Architecture. Styling by Judy Ostergaard. Photography by Derek Swalwell. 10. Dark wood shelving in the kitchen matches the open shelving in the bar area just off the kitchen. 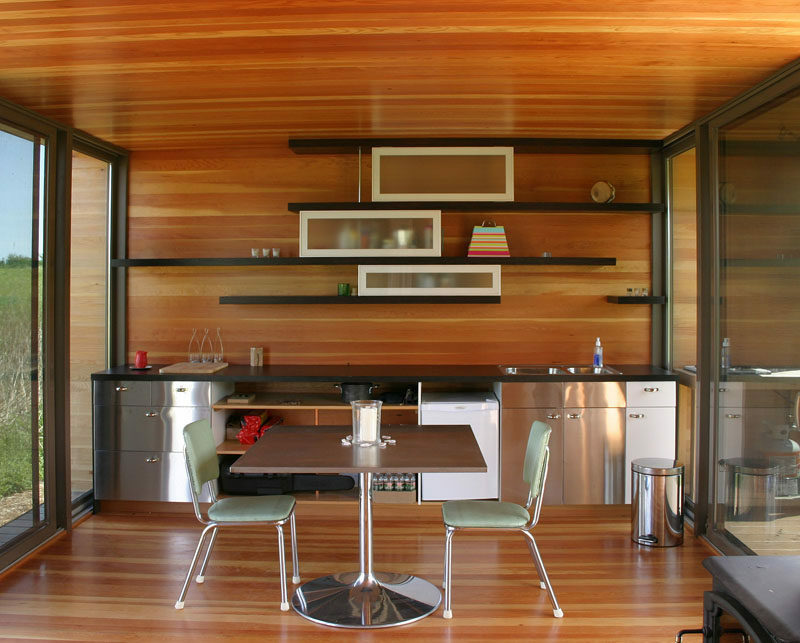 Designed by Harvest Architecture, Von Fitz Design and Cliff Spencer Furniture Maker. 11. 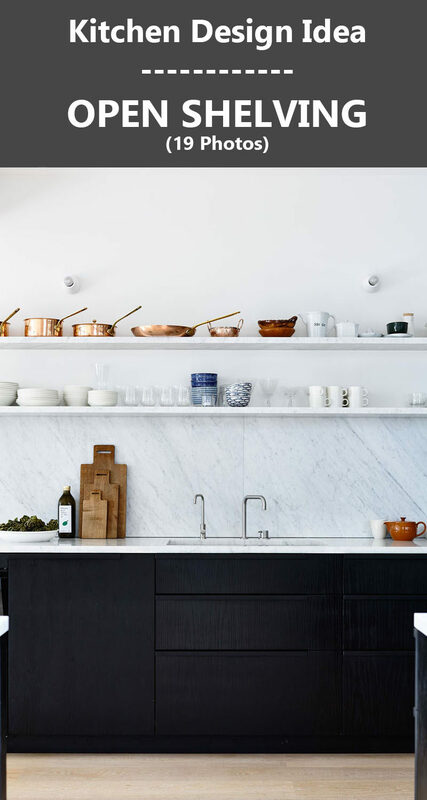 This kitchen has a mix of both open and closed shelving, but keeps the pretty things on display and makes sure that the sparkling water supply is always full. Designed by Alice Lane Home Collection. Photography by Meikel Reece. 13. These wooden shelves are deep and divided, but lack cupboard doors which makes the fun colored plates and mugs act as kitchen decor. Designed by MSR Architecture and Interiors. 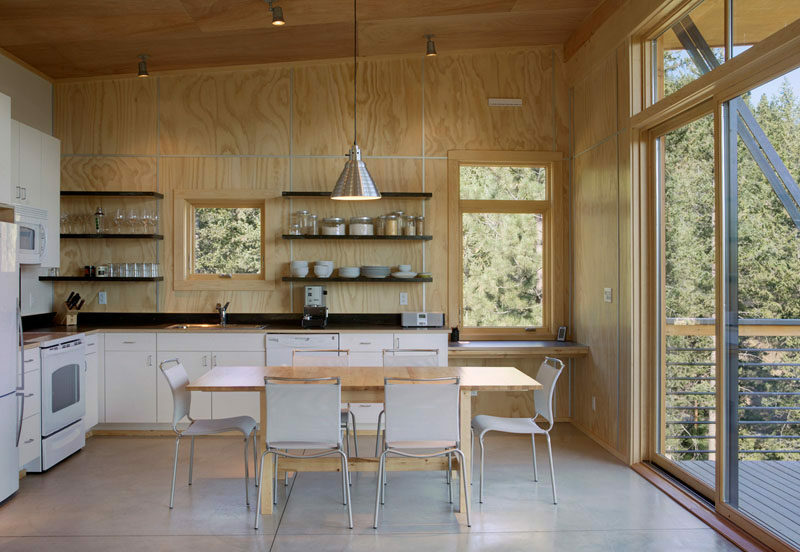 Wood work by Welch Forsman and Ingrained Wood Studios. Photography by Alyssa Lee Photography. 14. Dark wood shelves against the light wood walls make a statement but are kept from feeling overpowering by the lack of cabinet doors. 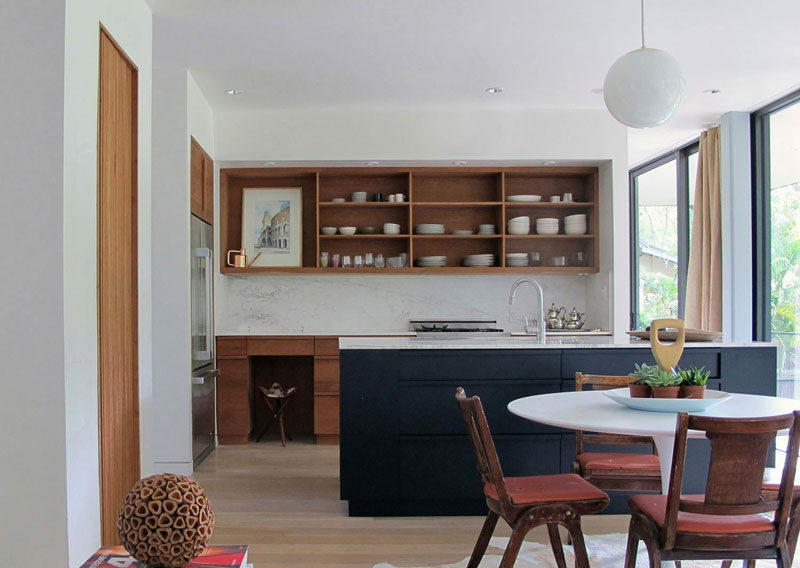 Designed by prentiss+balance+wicklane Architects. Photography by Steve Keating Photography. 15. 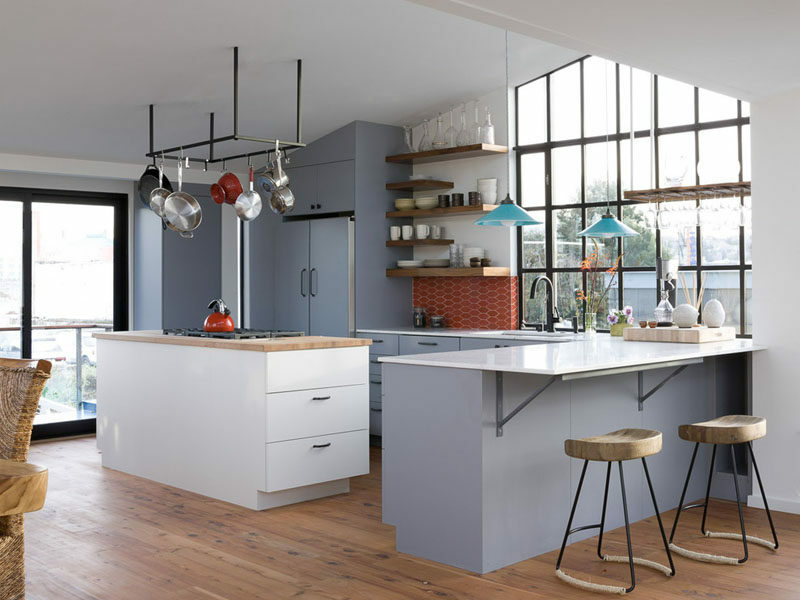 The stainless steel shelves above the sink and work space of this kitchen make it feel industrial, but the earthy ceramics soften the overall feel and warm up the space. Designed by Incorporated Architects. Photography by Eric Straudenmaier. 16. 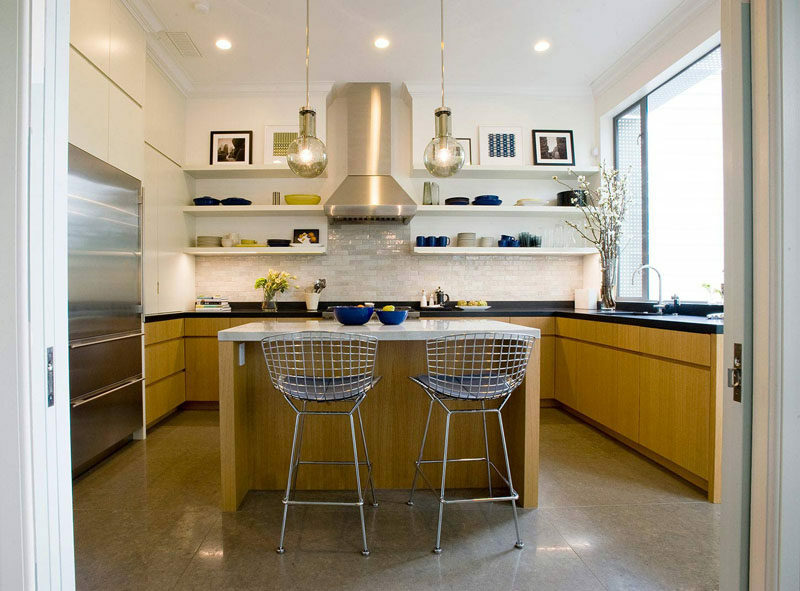 The open shelves in this kitchen are used to display the daily plates, mugs, and serve ware, with the top shelves used as a place to display favorite pieces of art. Designed by Todd Davis Architecture. Interior Design by Sara Story Design. Photography by Pamela Palma. 17. Dark wood shelves in this kitchen match the other dark elements, but because they keep much of the tile backsplash visible, allow the space to maintain a bright and airy feel. 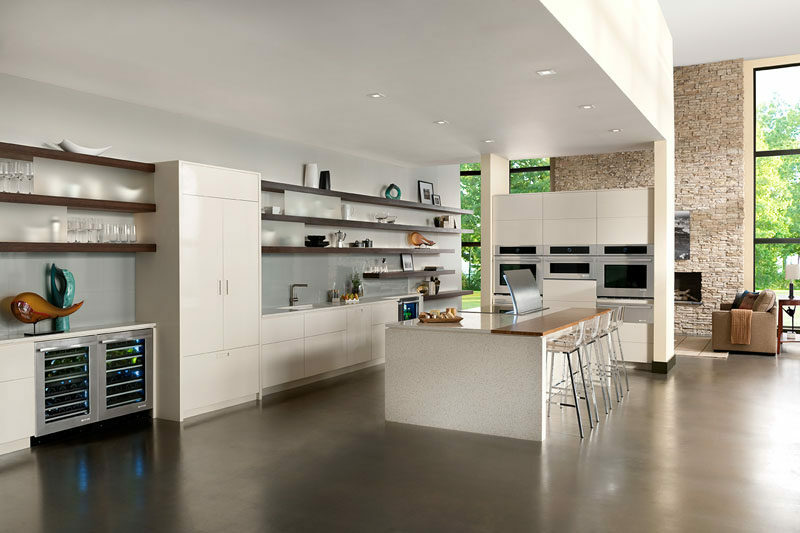 Designed by Feldman Architecture, Inc. Photography by Paul Dyer. 18. Long open shelves are broken up with pieces of frosted glass to keep the less beautiful pieces slightly out of focus. 19. 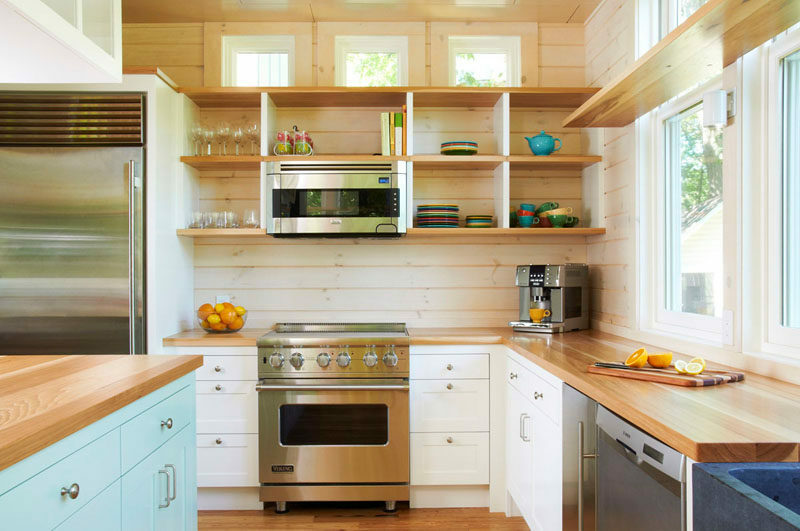 This small kitchen has uneven open shelving with a few closed parts to add more dimension and provide a bit of extra storage for things they don’t want to have out in the open.